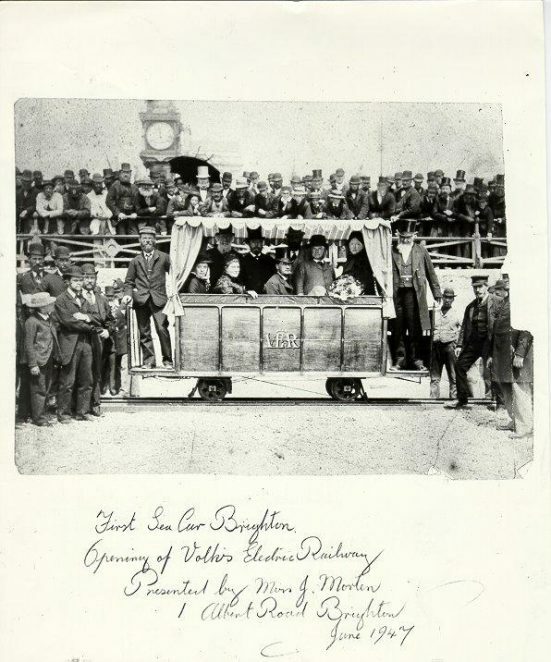 a) CONSTRUCTION: This, the first public electric railway in Great Britain, was preceded only by lines at Berlin and Portrush, and opened on 4 August 1883, less than eight weeks from Magnus Volk’s initial approach to the council. A car for a dozen passengers was built with mahogany sides and blue velvet curtains, and ran for about 300 yards along a two-foot gauge track which was laid on the beach from opposite the main Aquarium entrance to the Chain Pier . Using power from a 50-volt generator which Volk had previously used for lighting his house in Preston Road, the car had a maximum speed of 6 m.p.h. and the railway operated smoothly for a month until a storm on 1-3 September 1883 damaged the track. The line was quickly repaired, however. b) FIRST EXTENSION: With the immediate success of the line it was not long before an extension of the railway to the Banjo Groyne was approved. Volk rented an arch below Paston Place as a workshop, and work on the new line started in January 1884. Opening on 4 April 1884, the first train on the new line was overloaded with officials and grounded on a crossing, but the railway opened to the public three days later with no problems. The completely new track, on a gauge of 2 feet 8.5 inches with transverse sleepers, was now 1,400 yards long and dived under the Chain Pier ; there was also a passing loop and platform halt at the halfway point. A new car was built, nineteen feet long with sliding doors, electric lighting and room for thirty passengers, and a new generator was installed in the Paston Place arch which was initially used as a waiting room. The maximum speed was increased to 10 m.p.h., and a second car was built in 1885. In about 1886 major changes were made when a three-rail system was installed on a wooden viaduct above the shingle. However, it was not all plain sailing for the railway as it attracted considerable opposition from cab-drivers, bus operators, boatmen, and those worried about safety and access to the beach. It was, in fact, occasionally sabotaged. The opening of Volk's Electric Railway at 12 noon, Saturday 4th August, 1883. Magnus Volk, wearing a peaked cap, is standing on the left footboard. The Mayor of Brighton stands on the right footboard. Anna Banfield, wife of Magnus Volk is seated on the left inside the car. Several hundred onlookers witnessed the first voyage which took place a few minutes after this photograph was taken.